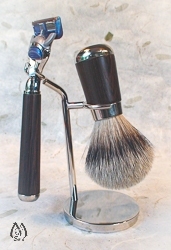 Genuine Wenge Wood and Nickel Three Piece Set comes with five blade Fusion® razor. Includes "silver tip" brush and holder. Complement this set with a lather bowl or mug.